Educational podcasts blend technology and learning in an iPad classroom. You can share the podcasts your students create through audio sharing websites like Audioboo or iPadio. Assignments that incorporate podcasts improve student’s communication and collaboration skills, and sharing those podcasts is an important part of the process. As is the case with SoundCloud, Audioboo works both over the web or via a downloadable app on your iPad. Record your “boo” and then publish it to your account. The free account limits your recordings to 3 minutes each, but you can upgrade your account and get up to 30 minutes recording time. You can add titles, tags, geolocation info, and a photo to the recording before you upload it, and it’s all saved with the recording. Podcasting, as you know, consists of audio or video files that are placed on an Internet server where subscribers can download them for listening/viewing. But what about phonecasting? 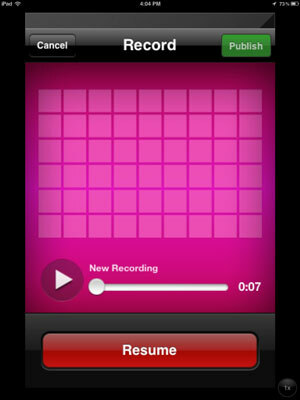 iPadio allows you to broadcast live to the web from any cellphone, or record and publish from the iPadio app. Download the iPadio app and sign up for an account on the iPadio website. You’ll be given a phone number to use for live phonecasts and an account to upload your published recordings. iPadio will record and share high-quality audio of up to 60 minutes. When you create and upload a recording (a phlog) to your account, it’s given a unique URL that you can include on any website to share with others. You can also create a channel for your class phlogs and designate yourself as the moderator.